The pioneering friendship between Sunderland and China will be further strengthened as the Leader of Sunderland City Council travels to its sister city of Harbin in the New Year. Council Leader, Councillor Graeme Miller, has been invited to Harbin, the capital of Heilongjiang, to represent Sunderland at the China-Harbin International Sister City Conference from 4 – 7 January 2019. The event, which brings together representatives from Harbin’s 35 sister cities from 27 countries, will provide a platform to showcase Sunderland’s experience of building strong, long-lasting international partnerships. Cllr Miller will deliver a presentation as part of the International Cities Symposium during the busy four-day visit, in which he will highlight the far-reaching educational, cultural and economic benefits of the decade-long friendship with Harbin for Sunderland and its people. The ground-breaking friendship agreement between the two cities was signed almost 10 years ago in May 2009. Boasting one of the world’s fastest growing economies, the aim of the agreement was to develop joint initiatives between China’s Harbin and Sunderland, which would prove mutually beneficial to both cities. Since then, the cities have taken forward a wide range of initiatives including multiple school partnerships, educational programmes and a number of trade missions. Cllr Miller said: “I’m honoured to be invited to Harbin to represent the city of Sunderland at such an important meeting of leaders from cities across the globe. We are committed to developing our international partnership with Harbin and this event provides the ideal opportunity to deepen those links, explore future opportunities and to share experiences and ideas with people from other cities around the world. “Since our partnership began almost 10 years ago, we have worked closely with our friends in Harbin to deliver a range of initiatives, with a particular focus on educational programmes. This has resulted in once-in-a-lifetime opportunities for headteachers, teachers and pupils to travel to Harbin to meet with partner schools, which has helped broaden the horizons and experiences of all those involved. “Opportunities like this arm young people with the global awareness and competencies they need to work in a global economy. Having this level of insight and understanding of different cultures can really help them during later stages of life. Councillor Miller and Catherine Auld, Head of International Relations, Business Engagement and Investment at Sunderland City Council, who is accompanying the Council Leader on the visit, will meet representatives from Harbin Municipal Government, Harbin Education Bureau and Harbin Economic Development Zone to discuss future plans between the two cities. The visit also coincides with Harbin’s Ice and Snow Festival, which is one of the city’s major annual events. Conference delegates will have the opportunity to take in some of the festival during the weekend. Harbin, which is the eighth largest city in China and has a population of over 10 million, is seen as a gateway to Asia and key markets in Russia and South Korea. It is a major centre for power generation, chemicals and automotives with developing industries in ICT, electronics and software. Harbin is Sunderland’s newest sister city, preceded by Washington DC in the US, Essen in Germany and Saint Nazaire in France. The friendship agreements form an integral part of Sunderland’s International Strategy to ensure international opportunities are maximised for the benefit of the city and its residents. OH BUOY! 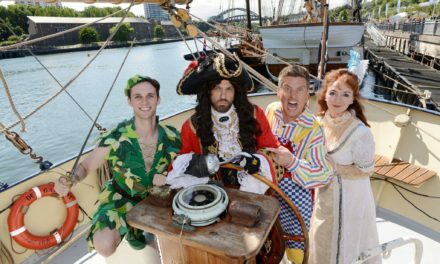 Star-studded panto cast visit The Tall Ships to launch Peter Pan!